TALKING DESIGN ON THE META-LEVEL. INSIDE MARKUS T'S TRANSPARENT WORKSHOP. 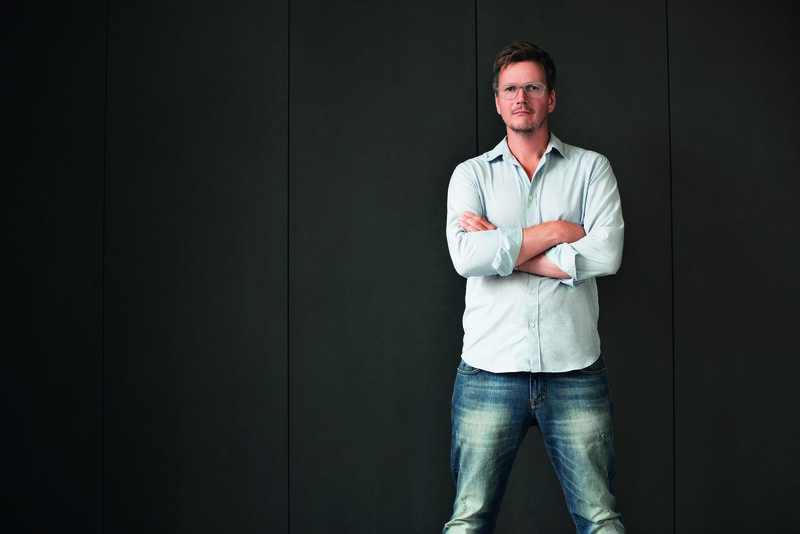 Markus Temming has been following his passion for product design for some time now. And his talent is undeniable. With his eponymous eyewear label, MARKUS T, he’s been supplying the global eyewear business with quality products Made in Germany since 1999. But until recently, his design pursuits beyond the world of eyewear have largely gone unnoticed. 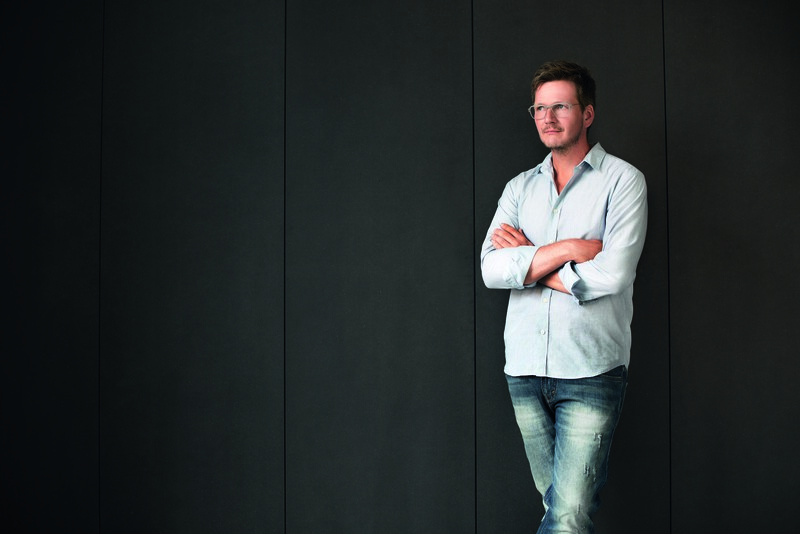 That is about to change, after the label recently moved into a new company headquarters – remodeled according to Markus’ vision – with a transparent concept inviting visitors to glimpse into the production process of MARKUS T eyewear. 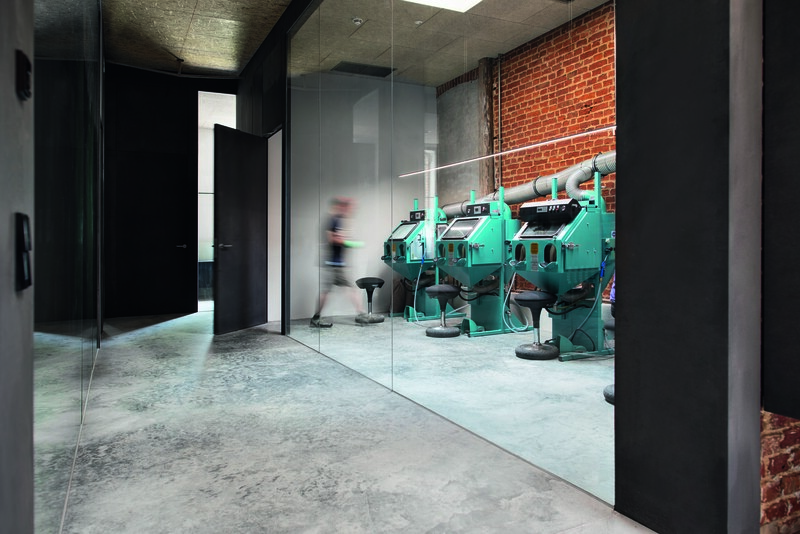 SPECTR had the privilege to tour the new center of the MARKUS T eyewear world – and came back quiet impressed. The former schnaps distillery outside the German town of Gütersloh has been restored with a love for detail and the overall vibe is more of a wellness getaway hosting yoga retreats than an eyewear manufacturing site in the traditional sense. Two years ago, Markus purchased the sprawling grounds for his new headquarters – listed as a monument conservation site – and poured lots of creative energy into the renovation and re-model. Aside from his love for historic buildings, Markus also made the decision for economic reasons. His label MARKUS T has seen rapid growth, to a staff of currently 80 employees, which necessitated constant office expansions over the years. The operating phrase here is “necessity,” because resulting workflows and internal structures often left much to be desired. “At some point we were just in way too tight quarters,” said Markus. Moving into the new site provided a clean slate; a chance to plan work processes in administration and manufacturing from scratch, while also adding new machinery. But beyond process optimization, the standout feature of the new company headquarters is the underlying design language apparent in all parts of the operation – from the CEO’s office into sales and production. Every department is furnished with the same cabinets, the same desks, and the same lighting fixtures. In other words, there’s no hierarchical privilege when it comes to furniture at MARKUS T, and all interior designs were created in-house. As a side project beyond their day-to-day work, Markus and his employees went the extra mile to create a progressive and fully decked-out workspace that is a true standout in the optical industry. Much like in his eyewear designs, Markus placed special emphasis in the use of materials during the renovation. After all, the new offices are a true reflection of the brand’s philosophy. Materials are high-grade, lightweight, and all the while robust. All cabinets and desks throughout the entire building are crafted from sheets of CDF, while the lighting fixtures – assembled from screw-less components like the brand’s eyewear frames – appear to levitate above the work stations. On that note, the entire workspace is furnished entirely without the use of veneers, solely from raw materials. Adding the final touches to the interior design are exposed brick walls, light concrete floors and large-sized glass panels. 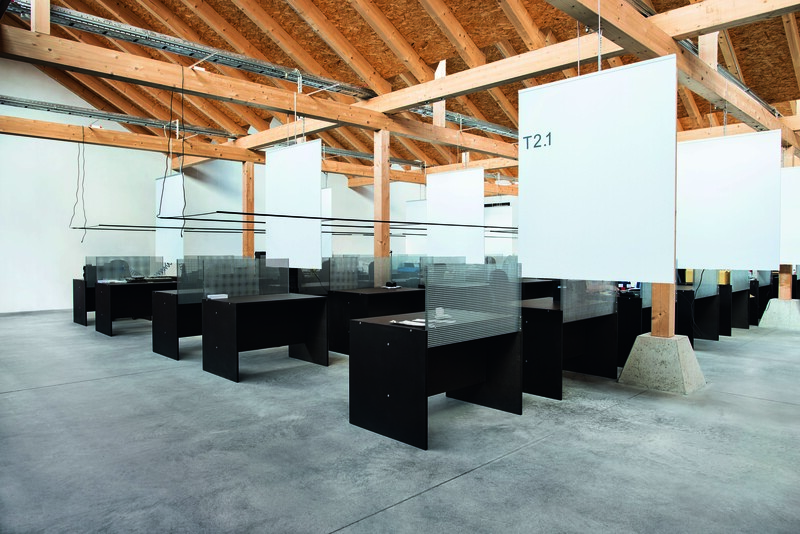 Every single office and production space is exposed – made transparent – via glass walls. Markus calls this a “transparent workshop” and invites all opticians to come visit the new site to get a glimpse into the “on demand” production of MARKUS T eyewear. During the move, the company also got rid of its warehouse. From now on, all frames are produced in weekly runs based on orders. 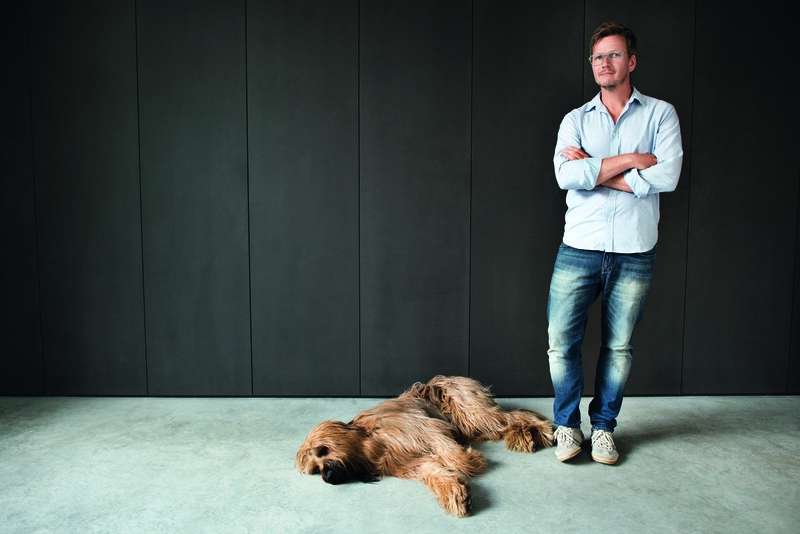 In the optical business, Markus Temming has been known for pushing the boundaries for some time now. Since 1999, the innovative designer has been creating exclusive eyewear under his eponymous label, MARKUS T. With manufacturing sourced 100% in Germany, the label’s signature style is at the intersection of intelligent technology and progressive design according to the highest quality standards. Over the years, MARKUS T has pioneered – and perfected – several technical processes that have lent his glasses a unique look, far beyond the mainstream. The most striking detail of his glasses, hand-made at a workshop in Westphalia, Germany, is the screw-less hinge construction: Developed by Markus Temming himself, the proprietary block hinges not only offer a viable alternative to regular screw hinge constructions, they also eliminate the need for follow-up tightening at the optical store. In his choice of materials, MARKUS T is focused on quality and long-lasting performance. From the start, high-quality titanium has been at the center of the collection, mainly due its combination of features: titanium is antiallergenic, ultra-light, and known for longevity. From a manufacturing perspective, titanium also lends itself to the smart and progressive frames the label is known for – the perfect symbiosis between materials and aesthetics. When Markus Temming and team wanted to offer the same qualities in frames crafted from plastics, they searched the entire market for a material to fit the bill. But no such luck. Ultimately, the label developed and patented its own kind of polyamide – known as TMi – that has earned a great response among MARKUS T’s loyal followers. Hello Markus, you have a lot going on right now. Why did you move your company HQ? Soon after launching my independent business in 1999, I was already playing with the idea of repurposing the former schnaps distillery in the town of Isselhorst. On my daily commute to work I kept passing the property dating back to the year 1689. I was really fascinated by all the different building components that had been added over the course of centuries. This initial idea finally came to fruition when MARKUS T was in a position to expand and open up more space for creative ideas. The property had been available for several years at that point, so we seized the opportunity to move in. What led to the idea of expanding your operation? The label MARKUS T has been growing steadily, so expanding the workspace was a necessary investment. It’s also in line with our company philosophy of maintaining growth and reinventing ourselves. In the eyewear business, it’s important to build a strong, self-confident position to stand out on the oversaturated market. Our main keys to success have been the steady improvement of design and technology as well as constant flow of novelties. How much of Markus Temming’s input went into the new company building? One hundred percent! I was involved in building the entire new workshop as the main designer and source of ideas. From the overall concept all the way to the tiniest light switch, I was able to pour all my passion and ideas into the process. I also had the chance to design the furniture and lighting fixtures. The result is a space that not only carries my design signature, but also offers plenty of space for living our company philosophy: team spirit, family friendly atmosphere, creative work – a place where people can feel comfortable. With the necessary quiet for contemplation, but also vibrancy for inspiration. It’s really not that common for an eyewear designer to take over the reigns of a building’s interior, much less provide his own designs. Are you bored? No, not at all, but I’m just having a blast with designs. It’s my passion and doesn’t feel forced at all. But then again, wouldn’t your time be better invested in other areas? People could see it that way in the traditional sense and I get the occasional hint from my employees to that extend. Next to my personal enjoyment, taking product design beyond the realm of eyewear opens up some clear advantages. By diving deep into the creative process behind other kinds of products, you get ideas that can come in handy for implementing into eyewear. The designs cross-pollinate. Is the new location supposed to positively impact morale? It goes far beyond the mere company level, since I also put great emphasis on developing the concept behind the new estate. On about 8,800 square meters, the areal is home to an energetic mixture of work, housing, and play. In the multi-faceted architecture of the former distillery, every single building component radiates its own sense of individuality. With the company MARKUS T at the center, the property will be home to numerous others, including restaurants, a barbershop and a car sharing company. The company grounds of MARKUS T will be alive with action 24/7. It’s also rather peculiar that the manufacturing segment looks exactly like the administrative offices. Yes, I wanted to make a point of the fact that our company doesn’t have any “second class” workspaces. The employees on the production end make a contribution just as valuable as those in sales and marketing. For lunch we all take our meal in one single kitchen, which increases team-building. Well, the production segment seems really tidy. We try to keep work stations as clean as possible. And it’s not just self-serving, since we practice “job rotation.” We don’t want our manufacturing employees to keep performing the same tasks, day in and day out. Instead, they have the chance to tackle new jobs at new workstations throughout their work day. This makes work much more enjoyable for individual employees and makes them more flexible. Will the building’s underlying interior design concept be implemented in other areas? Yes, in multiple ways. We’re working on POS-modules for our opticians and our own store in the town of Bielefeld will receive the same look soon. Our future tradeshow booths will also be modeled on our new HQ at the former distillery. The new headquarters will also be open to visitors. What is the motive? Yes, we’re running a “transparent workshop.” This means that end consumers and the public can schedule an appointment to dive into the universe of the MARKUS T eyewear workshop. Our guests can see all the ins and outs of production right here on-site. And are opticians welcome as well? Yes, the “transparent workshop” is also open to all our customers. Next to visiting our production site, opticians are also invited to see the workshop’s new showroom where they can check out all our latest collections, talk to our representatives and place orders. Speaking of new collections, which technical developments will be featured in the new MARKUS T line? First of all, we revolutionized and expanded the existing M1 Collection and M3 Collection. We put a strong emphasis on form language, design, and functionality. The technical characteristics are more balanced than ever. We have updated our screw-less hinge in terms of functionality and put a stronger focus on the visible, reductionist technology. Other key characteristics include our patent-pending coloring process and the modified edition of our TMi polymer for the upcoming autumn collection. Will there be a new color concept behind the new MARKUS T collection? We are staying true to the existing color concepts at MARKUS T, including signature colors such as grey or purple. Having our own coloring process allows us to respond quicker to trends while continuing to experiment with new colors beyond our classics to integrate within our overall concept. Thanks for the interview and showing us around as some of the first visitors at your new workshop.